Tourist Radio FM Stations have been used in a variety capacities for over 30 years in Canada. Often used in National Parks and Points of Interest, there has been little commercial utilization since the original CRTC initiation. This has been due to the restricted regulatory requirement of NO ADVERTISING! The CRTC regulatory change, to allow paid advertising (now) allows these stations to be sustainable. Along with being a promotional tool for businesses involved in tourism; it is also an opportunity for ECONOMIC STAKEHOLDERS to provide support for their towns general economic growth. In short, Visitors and Tourists mean business for everyone! Based on our experience and knowledge of low power FM radio and the regulatory requirements associated; we have developed two options. The two options have considerable overlap but have the unique distinction of where the funding comes from to support the broadcast. The Visitors Radio option is supported by economic stakeholders in the town. 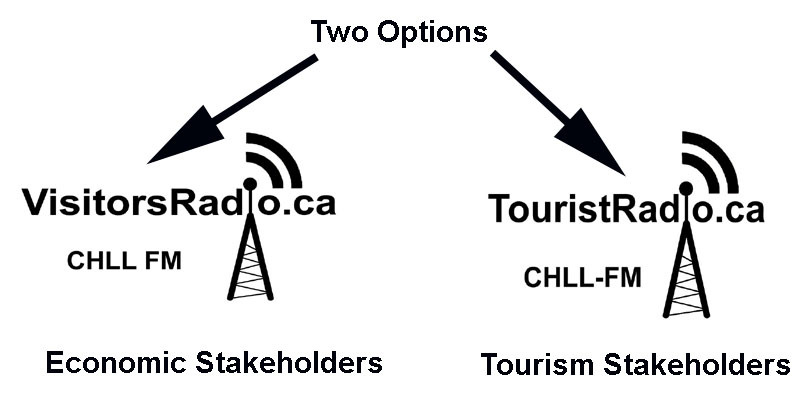 The Tourist Radio option is supported primarily by tourism stakeholders. The start up and operational costs are discussed for each option. The links below act as an online presentation and will answer the majority of questions that would be posed. Thank you for reviewing these opportunities.